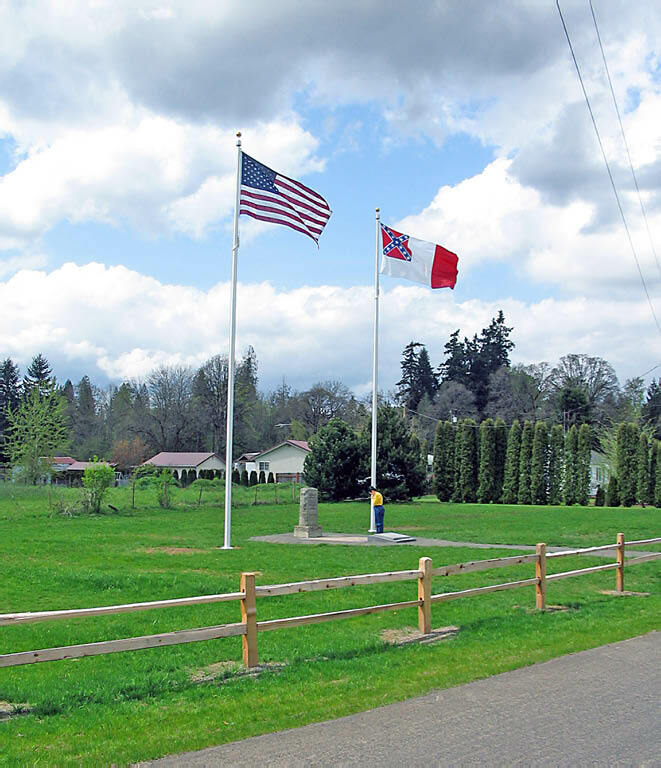 Jefferson Davis Park is located at 24024 NW Maplecrest Road, Ridgefield, Washington. On May 23, 1941, at the Washington Division UDC Convention, Mrs. Charles E. Bolling, President-General of the UDC read a telegram stating, “Congratulations upon completion Jefferson Davis Highway Marker and Greetings.” Signed Eleanor Roosevelt. The concept of a Jefferson Davis Memorial Highway was presented and adopted at the UDC general convention in 1913. The plan then was to have a highway that would begin in Virginia on the banks of the Potomac and pass through the states of Mississippi, Tennessee and into Kentucky to Davis’ birthplace. The highway continued to move west through Louisiana, Texas, New Mexico, Arizona and into California where it stopped at San Diego. The members of the UDC Washington Division wished to have the highway extended into this state. From research done in the archives of the University of Washington in Seattle, Mrs. May Avery Wilkins found many ties between Jefferson Davis and Washington Territory. While serving in the Federal Government, Jefferson Davis pushed for westward expansion, adding forts, arsenals and other public provisions. He was one of seven appointed as a special committee to decide the expenditure of the inheritance from James Smithson. He pushed for using the money for an institution to benefit science and diffuse knowledge and new information throughout the country. Today we know this as the Smithsonian Institution. President Franklin Pierce appointed Mr. Davis Secretary of War in 1853. During that time, he increased the United States Army coastal defenses, increased the military wages, and gained a new pension system for military widows. He upgraded the military weapons to percussion rifles. He directed three surveys for Trans-Continental railroad to the Pacific. He appointed Isaac Stevens, the first Governor of Washington, to head the northern route survey who requested George B. McClellan to be Principal officer on the survey team. Davis made it mandatory for all surveys be done by the new geodetic method which provided a higher degree of accuracy by taking the curvature of the earth into account. Secretary Davis directed McClellan to construction a military road from Walla-Walla to Steilacomb, Puget Sound. Then a road was constructed from Fort Steilacoom to Bellingham Bay to the new army post. Making roads to move the military was top priority for Secretary of War Davis. Many of the roads and highways today throughout America are descendants of roads championed by Jefferson Davis. To provide the best route for a transcontinental railroad, Davis had James Gadsden buy a region from Mexico that became a part of Arizona and New Mexico States. Davis spoke widely for harmony between the Union. He proclaimed himself a dedicated Unionist opposing secession while dedicated to the principles of democracy and state rights. He worked to block the northern drive to control the country. He left the US Senate to join the Confederate Army when Mississippi seceded from the Union but was elected president of the newly formed Southern Confederacy. He sent a peace commission to President Lincoln who refused to meet with them. The Jefferson Davis Memorial Highway 99 and markers are to honor all of Mr. Davis’ services in the development of this country. In the late 1990’s the Highway marker originally placed in Vancouver in 1939 was quietly removed by the City Manager due to the insistence of an “offended” City Councilman. In 2001, members of the Seattle Chapter of the UDC and the Portland SCV Camp learned what had happened, and together with our good friends of the Olympia Chapter of the Sons of Union Veterans of the Civil War, we spent more than a year fighting the City of Vancouver to reinstall the marker. Instead, after culminating into a public town-hall meeting where the citizens of Vancouver, with the full support of the Director of the Clark County Historical Museum, decided that the best thing for the marker would be for it to be placed at the Historical Museum. The City Council approved the good citizens’ opinion with a formal vote, and the marker finally found a home outside the Museum on the corner of Main & 16th. But it was no fairy-tale ending. Five years later, a new Director assumed command of the Clark County Historical Museum and worked tirelessly to have it removed from the grounds by any means possible. With protests from the UDC and SCV, the marker was moved “temporarily” in the fall of 2006, with the sanction of the Clark County Historical Commission, allegedly to keep it safe during the construction of a new handicapped-accessible entrance. We knew it would never go back, and sure enough we had another fight on our hands. We took our fight to the Clark County Historical Commission, who was the body that had to approve the “temporary” move of the marker in the first place. After some debate, the majority of the Commission sided with our Cause, and one of the Commission members said that she would see us at the next City Council meeting to support us in getting the marker placed back at the Museum, and may be even back at its original location at the Covington Cabin. At the City Council meeting The Mayor of Vancouver came down rather swiftly and severely stating that the marker was in fact considered a “gift” that the City no longer wanted, that the marker would never again sit on City property, and that the issue of the marker would/should not come before him again… Neither the history of Jefferson Davis in the Pacific-Northwest or the historical marker itself means anything to the local officials or the Director of the Historical Museum. Faced with this decision, there was no choice but for us to procure a piece of land of our own, specifically for the placement of the Jefferson Davis Highway marker where it could remain permanently. This project is not just saving history, which is phenomenal enough in itself, but we are making history! Today, Jefferson Davis Park is the Northwests shining tribute to President Davis. It now houses both the Vancouver and Blaine, Washington, Hwy 99 Markers, safely preserving them for future generations. SCV Camp 458 has spent countless hours maintaining and improving the Park, since its inception. All work is done on a strictly volunteer basis, and we gladly encourage others to help. Feel free to come by and visit our beautiful Park! For more information, or if you have any comments of concerns about Jefferson Davis Park, contact scvoregon@gmail.com. Please support us in this very noble and worthwhile Cause. Deo Vindice! This is a beautiful park. 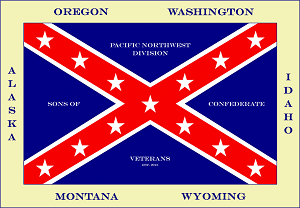 I wonder if the caretakers would consider replacing the Imperial flag with a Bonnie Blue Flag, so that both flags represent the Confederacy? Thank you. Thanks for your input on the flags at the park. We are currently flying a 6×10 3rd national, with a 5×8 bonnie blue flag below it. The other pole has a Betsy Ross flag on it, instead of the 50 star. The flags need replaced soon, so we are trying to figure out what flag we want to fly next. We might just run a Battle Flag. At lease the Betsy Ross flag represents liberty, which is mainly why I suggested we fly it for the time being. Thank you, sir. I think the Betsy Ross flag is entirely appropriate, and an excellent choice, as it is the flag of the First Confederation and the True Republic. I fly the Betsy Ross flag over the Bonnie Blue flag at my house. Best wishes to you, and thank you for your good work. Thank you for being willing to volunteer at the park. We can definitely use assistance on mowing and general cleanup. When you get a chance, please email me with your contact info. scvoregon@gmail.com. I look forward to hearing from you! Beautiful Park! I think that it is great to memorialize JD for everything he did to make the Pacific Northwest a wonderful place. Keep up the good work! So… Or maybe greeting them for talking back to brown people, or looking wrong at Chinese women, or trying to get an scrap metal, or maybe for daring to clean? Or are we talking more high flow, like making them use That other toilet instead of the back of the bus? I’m terrified of them becoming your social and political equals! Or do you mean commitment issues because the right to own other human beings is more important to you than the whole smorgasbord here? Inquiring minds want to know! Are you taking donations for the repairs? To answer your question, yes we are accepting donations for repairs at the park. Any additional donations will go towards park a security system and other improvements. If you feel the need to help us, we would greatly appreciate it.